In this traditional Italian combination, warm pan-fried pork chops complement cool, crisp salad greens. 1. 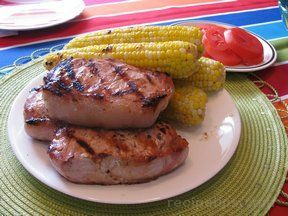 Sprinkle pork chops with 3 teaspoons of the Seasoning. Set aside. 2. Heat 2 tablespoons of the oil in large nonstick skillet on medium heat. 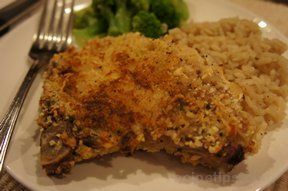 Add pork chops; cook 4 minutes per side or until desired doneness. 3. Toss salad greens, tomato and onion in large bowl. Mix remaining 3 tablespoons olive oil, vinegar and remaining 1 teaspoon Seasoning. Drizzle over salad; toss to coat well. Divide salad evenly among 4 serving plates. Top each with a pork chop. Serve immediately.